Meeting Place: Contact leader for details. Call or email no later than April 18. Come and bird/sketch favorite patches around Essex and Middlesex counties. Cosponsored by the Brookline Bird Club. Join us for a fun walk at the Cedar Pond Wildlife Sanctuary, former estate of Francis Higginson, who bequeathed his land and houses to Mass Audubon in the 1970s. This 158-acre property has a variety of wetland and woodland habitats and Cedar Pond, a large kettle pond surrounded by Atlantic white cedars. Come explore the property, discuss the history of the site, and look for wildlife and signs. We’ll also check out the 5-acre restoration site that MAS has converted from a field filled with non-natives to a native shrub habitat. Following the walk, we will head over to the Ipswich River Wildlife Sanctuary in Topsfield for a brown bag lunch and to hear about the lesser known MAS sanctuaries on the North Shore. Meeting Place: Parking lot #1 on Plum Island, on the left as you enter the refuge. Turn off your engines and leave your car behind as we cycle the main refuge road looking and listening for spring migrants. Be ready to peddle by 6:30 a.m. Cosponsored by the Brookline Bird Club. Enjoy some spring birding and a BYO sandwich or “take out” with other club members at Sissy’s lovely farm. The traditional bird-shaped cakes plus coffee/teas will be served in loving memory of Dotty Brown and Sarah Robbins who graciously hosted the club each May in Gloucester for over 20 years! From Rte. 1 driving N: Turn left onto Old Right Rd., across from First Fabricators (note: road is not well marked). Proceed on Old Right Rd. for about 6/10th of a mile until you see a rail fence, a red barn and white house with an old maple tree. Park along the frontage from the rail fence and past the house along the Norway Spruces to the field gate. Some cars can pull in front of the barn, too. From the Rte. 1 driving S: Turn right onto Old Right Rd. across from First Fabricators. Proceed as above. Participate in the 113th ECOC birding trip down the Ipswich River! Arguably the oldest uninterrupted bird-count in the world, this event is timed to get the best views of birds before full leaf-out, but late enough in the season to get better weather for paddling. Contact Dave for details. We will walk for 3 or 4 hours in the Eastern Point area of Gloucester, mostly on pavement but partly on woodland paths and a field that may be wet. Cosponsored by the Brookline Bird Club. During this 2-mile walk in the sand we will look for nesting Piping Plovers, Least Terns, and Bank Swallows, as well as evening songsters such as Whip-poor-wills. Prepare for mosquitos.. Co-sponsored by the Brookline Bird Club. PEM Connect Building is at 135 Essex Street, next door to PEM’s main entrance (at the corner of Essex and Liberty St. in Salem, MA). Morse Auditorium is in PEM’s main building. Note: if severe weather is forecast, call 978-745-1876 to confirm event. Please be advised: ECOC calendars are only sent via email, unless a member requests otherwise. The calendar can always be viewed here on our web site. Hard copies will also be available at programs. 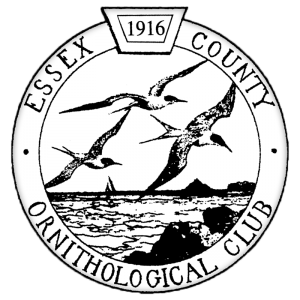 Become a member of the Essex County Ornithological Club or renew a current membership. Stay informed on upcoming ECOC events. Add your name to our e-mail list.